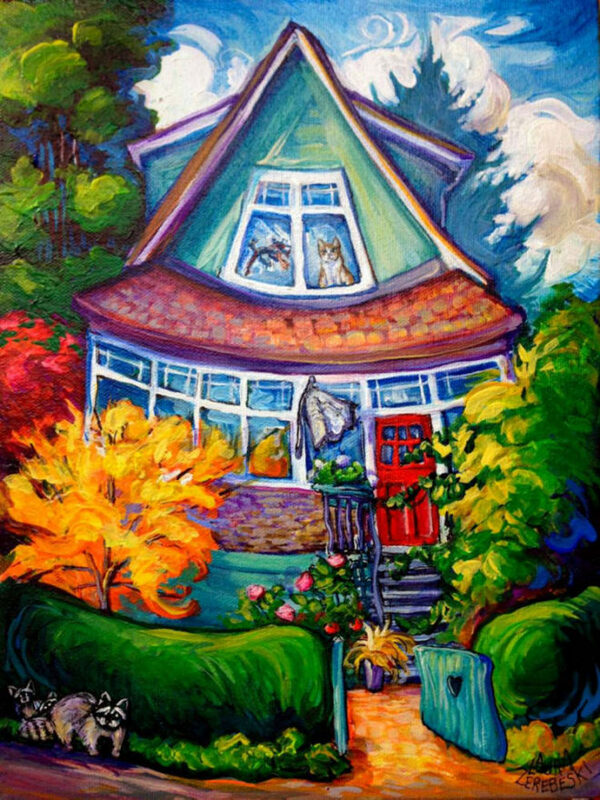 This charming East Van house has many personal touches that made it “home”, such as the open gate with an open heart on it, the tomatoes-and-roses front garden, the dragon suncatcher in the upstairs bedroom window, and the eagle flag waving by the front door. Colorful foliage surrounds the house: witch hazel is in full bloom on the left in front of a bright maple and a tall fir while “troll hazel” trails towards it on the right. Upstairs, a cat named William Stubbs watches a mother raccoon sneak along the front hedge with her two kittens. It’s been painted on a sunny day with lots of warm tones. Some houses have obvious faces and this one certainly does. The upstairs eyes wink and the large windows across the whole front wall give it a big, cheerful grin that is possibly a little more wistful now.